Raminder calls Leela up and requests her to say everything about him to Twinkle but she refuses to does so, he says that he still loves her mad just like before, but Leela does not listened to his words, instead asks why he drink when he can’t handle himself and advised him to not drink at this age of him, he have to take care of himself since he does not have anyone to take care of him. Twinkle is waiting for Kunj to come back home, but there is no sign of him and says why is Kunj’s phone not answering. She drops off on the couch. When Kunj comes home it's already too late and Twinkle is sleeping on the couch. He mentally says in his heart that he doesn't know how to tell her that Raminder uncle is her father only. He have to talk to his mom ( Leela) and tell Twinkle. He covers her. On seeing the window open he wakes her up and tells her to sleep on the bed, Twinkle tries to hug him that she don't know how to apologize but what she did is unforgivable. He stops her, she apologies for her doings. She asked him to forget all that has happened. He agrees and he says it doesn't matter, he won't let this get on his nerves and he thought he would give in to this wedding, and that it only proved that she does not trust him. Twinkle says sorry for few more times that she trust him and she shouldn’t have repeated it and that she is stupid and asks him to please forgive her, but Kunj stops her, he covers her with a shawl saying the problem is with him as he is over sensitive and that the damage is done and now there is no need to say sorry and he leaves from there. The next morning, Kunj goes to Leela and asks her to tell to Twinkle the truth about her father and asks what if she gets to know. But she refuses. He insists asking how long will she hide it and suggests her that Twinkle too is going to the Gurudwara just like her and there is no other peaceful place like the Gurudwara to talk about such a delicate matter with her daughter. Leela leaves from there without agreeing to his suggestion. Kunj follows her. Anita was ovehearing their conversation. She says what is going in between them? She decides to find out. At the Gurudwara temple, Twinkle prays to Babaji to help her to protect her marriage and make it strong. She try so hard to be a good wife but she make mistakes and that she and Kunj suffer because of that. She prays and then sits on the other side, just then Leela comes there, when Twinkle sees her mother she calls for her and Leela goes to sit next to her daughter. Twinkle says sorry for yesterday night's mistake, Leela forgives her and tells her to not worry. Then Twinkle gets sad on seeing a father daughter scene and Leela asks her what happens and further asks if she will hide things from her now. Twinkle starts telling her about the fact that she misses her father and how it would have helped her to have a father. Adding that she (Leela) didn't have to face all this and he would have taken care of her. Just then Kunj and Raminder arrive there and they hears the conversation going on between Leela and Twinkle. Where Twinkle says she feel her father absence and if she had him, she would have understand Kunj better. She know she never said that and she thanks her mother for choosing Kunj for her and saying that Kunj is the best husband that a girl can get. He always takes care of her and really understands her. She know what the value of a good life partner is. Leela is impress and says she have become mature. Then Twinkle says that if a girl meet a good man, her life is becomes easy and for that only she too wants her mother to have someone with whom to spent the rest of her life with as she can’t live alone and she should have someone to love her. Leela tries to dissuade her, but Twinkle continues to insists at a point Leela looks on the otherwise and sees Raminder. Kunj immediately hides. Twinkle gets up and goes to Raminder and asks why is he stalking her mom? On the other side Anita comes to Leela's house and saying to the servant that she will wait for her inside she goes to Leela's room in the search of a proof that can helps her to understand how Raminder and Leela are connected. 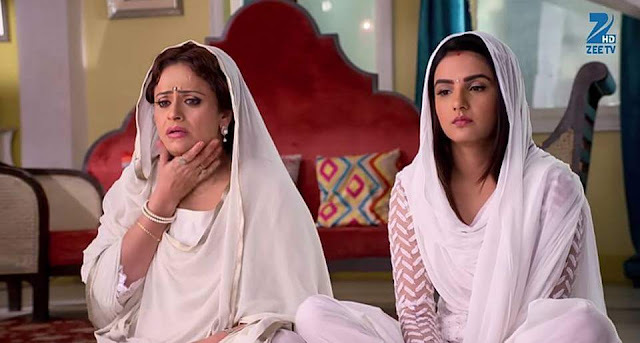 At Gurudwara temple, Twinkle tells Raminder that her mom helped him as much as she could and tells him to stays away from her mother, that if he continues to following her mother she will make him suffer and that she is warning him for the last time. She tells her mom to come and they leave. Anita who is looking for evidence that connects Leela to Raminder finds a picture under Leela's pillow, the picture is ruined and the faces are not clearly visible, but she takes a snap of the pictures and leaves from there to investigate further as it must be important. Kunj is polishing his shoes and Twinkle thinks he is going out and she tells him that he is not going anywhere and that they are having dinner together and she goes on with her planning. He stops her and says that he was not going out and that he was polishing his shoes for tomorrow. Then accidentally she puts the polish on Kunj's face and on tries to remove it they share a funny moment where she says she can’t let him stay mad at her. He asks what is she trying to do? She says she is apologising to him lovely says he is so nice. Kunj asks her what's going on and why is she touching his cheek? She says he is so sweet.l and manages to cleans his face. The next morning Twinkle goes to her mother's place and announce to her that this year she will organize her father's anniversary. Leela is shocked to hear it and tries to discourage her, but Twinkle goes on with the preparations saying to her mother to not worry that she will take care of everything and that she will call her when its havan time. Leela says in heart she have to stop it. On the other hand, Kunj gives lemonade to Raminder and says past recalling is useless. He have to win Twinkle’s heart as she hates him seeing him with her mom. But they can't tell her until she likes him a bit. Leela calls Kunj up and tells him about the death anniversary that Twinkle is planning for her dad and asks him to do something to stop her. Kunj says that he will handle everything. Kunj tells Raminder about this and he is shocked. The pooja is about to start. Everyone is present, Twinkle welcomes them and Anita taunts Twinkle. The priest arrives and asks to Twinkle to bring her mother down. Twinkle brings her mother. Then when all are settled the priest asks if he can start and Twinkle says yes. Leela is worried and thinking how Kunj will stop all this and if he will be able to stop the havan (prayer) and that this Havan should not happen. While Kunj and Raminder are driving towards Leela's house, Raminder says they have to stop that Havan, Kunj assures him that he won't let it happen. The havan starts, Leela is tensed as the priest recites holy lines, Twinkle asks her to not worry about anything. Kunj and Raminder reach outside, he tells Raminder that they can't go inside and they have to stop the Havan from outside home only. Leela thinks that only 5 minutes are remaining in 12pm and if this Havan gets completed then it won't be good as Twinkle’s father is alive. The priest asks Leela to give her hand for rituals. Kunj comes to the electricity board, he takes the tool and tries to cut the electricity wire but isn't able to do it. The priest almost finish with the rituals when Kunj and Raminder tamper with some wires near the main circuit and the fire alarm goes off. Twinkle announce that there is some fire in the house and everyone leaves. Raminder and Kunj are happy. Kunj comes there and takes everyone from there, then signal his mother-in-law that it's doing and Leela gets calm. Anita sees the Havan kund’s fire and she gets some idea. She purposely drop her phone, she bends down to take it and takes this opportunity and puts Leela's veil in the fire. Leela’s veil catches fire, she shouts and manages to take if off in time. She feels dizzy and just when she is about to fall in the fire, Raminder comes running and catches her in time, he holds her, Leela sees him but faints. Twinkle and Kunj comes to her and asks her if she is fine?. Twinkle is worried. Kunj blows out the fire. Leela is still unconscious. Raminder asks her to open her eyes and apologize to Twinkle that he come her mother's house but he only came to apologize to Leela, and he saw her falling in the fire so he saved her. Anita gets a call from Cherry. He tells her that he is restoring that picture Anita took from Leela's house and soon they will be able to see the person’s face in picture and asks her to come to him. Anita leaves. Leela wakes up and Twinkle and Kunj are relieved. Leela gets up, Twinkle asks if she is fine? She nods, Kunj thanks Raminder for saving his mom’s life. Raminder says this was his duty. Leela isn't happy that Raminder saved her. Twinkle is dejected as the pooja couldn't get completed and tells them that time is passed and they couldn't do her father’s death anniversary. Kunj says she should be thanking God that her mother is safe and it feels like her father saved her mother and that it's like her father is with them and with her mother today. Leela looks at Raminder and Twinkle stares at Raminder too. Raminder is about to leave when Twinkle thanks him for saving her mother’s life today. Cherry meanwhile is trying to restored that picture with the photographer while waiting in the studio and asks him to do the work fast. Raminder asks for Twinkle's forgivesness and she says she can't forget that he did nothing to defend her mom's honour as she was blamed so she won't be able to forgive him and again thanks him for saving her mother's life and not to expect forgiveness from her. Anita reaches Cherry in the studio and asks him if the photo is cleared?. Cherry says it isn't done yet. Anita scolds him that he couldn't do simple work and this miffs Cherry asking her not to scold him as the work is in process. Raminder blesses Twinkle and leaves. Leela is sad and Kunj notices it. The guy doing the work tells Anita and Cherry that its impossible for him to do it as the picture is really old. Anita and Cherry are disappointed. While Twinkle and Kunj are in the room. She calls her mother and inform her that she will come to meet her later, she ends the call. She tries to make small talk but Kunj doesn't seem interested. She asks him if he is going college? He says yes. Twinkle picks out a shirt for him but he says he is okay with the one he has. Twinkle tells him to wear white shirt that it looks good on him. She brings white shirt, Kunj brings blue shirt and says every color looks good on him and asks what is he thinking?. She apologises to him again about that night that she said many ill words to him and request him to forget that night and Kunj asks her to let it be. She says lets talk it out that they can't avoid this and end this matter but Kunj doesn't want to discuss it. He finally decides to take the shirt Twinkle picked out for him and it makes Twinkle smile. Kunj says he chose it as it's his favorite color and not because she gave it. Kunj leaves and Twinkle smiles to herself saying that her husband can't even lie properly that white is his favorite. She called him a liar and thank God that atleast he is talking to her but he hasn't forgiven her but not worries as she will pacify her angry husband. Lawyer gives divorce papers to Maya, Kunj comes there and helps Maya in making the toughest decisions of her life. He apologises to her that he is late. Maya says she is not able to handle all this, Kunj tells her not to worry that he is here. Maya shows him her divorce papers, Kunj asks if she is nervous? He reminds her that she tried to save her marriage at all cost but the person who doesn't respect her, beat her, taunt her and she shouldn't be with that person, she is literate and should live freely and assures her that he is with her in every decision. Maya says if he was not with her then she would still be getting beaten up by her husband, she got the strength from him and that he is a very nice human, she signs the divorce papers and tells Kunj that she forgot to bring her bag, she request him to keep the divorce papers with him. Without hesitation, Kunj puts the papers in his bag. Maya tells Kunj that if he ever need her help then to tell her and she will do it for him. Kunj asks if she can act in fake play with him? They have to pretend infront of Twinkle that they are doing play together, and they will practice for the fake play. Maya says okay and asks what she have to do? Kunj thinks of something and smirks. Leela comes to Raminder’s house, she asks if Kunj came? He says no but he is on his way, he asks her to come in and she does. Raminder gets call from someone and leaves. Kunj comes there and asks his mother-in-law why she has tears in her eyes? Leela says she remember old memories, Raminder comes there too. Kunj tells Raminder that Leela is not able to forgive him and one day Twinkle will get to know everything so he have to leave. Raminder says he won't. Kunj asks his mother-in-law and Raminder that it's time to take decision, he says either his mom tell the truth to Twinkle about her husband or her husband should leave from here and they both have to decide. Leela and Raminder are tensed. Leela says she won't tell Twinkle anything. Kunj assured her that he will handle Twinkle. Leela says no, she starts leaving. Kunj starts acting with Raminder that he have to leave from here, he pushes Raminder away and he fall down. Leela runs towards him and gives support to him, she scold Kunj that he should respect his age and remind him that he is his father-in-law. Kunj asks why is she so worried about him? Why she came back and why she wanted to stop that havan? He further asks why she care for him so much? Leela says it matters to her as she care for Raminder and confesses in front of Kunj that she still loves her husband. She cries. Raminder smiles hearing this. Kunj hugs his mom and says he know but he just wanted to listen to her say it and that's why he had to do this. Leela is surprised. Kunj tells her to give one chance to her husband. Raminder folds his hands and plead with his wife. Leela holds his hands and cries, she says she is ready to forget everything, and she have forgiven him but he can't come in her life till Twinkle knows everything and forgives him. Kunj asks her not to worry that Twinkle will understand and will forgive her father too but they both have to help him and they have to act in fake play. They are confused. Kunj tells his mother-in-law that they will rehearse fake play in her house so Twinkle can come here too. Leela asks what this play is about? Kunj says this is about a husband and wife where the husband left his family and then he comes back after many years and his daughter and wife doesn't forgive him initially but in the end, the daughter reunite her father and mother. Leela asks if he think Twinkle will forgive her father too in the end? Kunj says they can atleast try and maybe it can ease things for Twinkle. Leela says she pray everything become fine between Raminder and Twinkle. Kunj’s college friends come there, Leela meets them all.